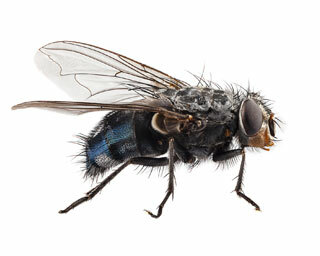 When flies feed on waste, they collect pathogens on their legs and mouths. These pathogens are then transferred to food on tables or counters when a fly lands again. Flies regurgitate on solid food then they eat the liquid. They are capable of transmitting disease when they vomit, groom themselves or just walk on surfaces. Every time a fly lands, it sloughs off thousands of microbes. If a fly lands on food or utensils, customers may ingest germs that can trigger serious illness such as diarrhea, food poisoning, meningitis and bloodstream infections. Use in open areas near buildings and campgrounds. One dispenser treats outdoor areas up to 30m2. Multiple dispensers can be used to treat the entire outdoor area to be protected, but do not use more than one for every 30m2 of outdoor area. Hang the dispenser 1,80m2 above the ground, out of the reach of children and pets, or place on a sturdy flat surface 1,50m2 to 1,80m2 above the ground, out of the reach of children and pets. Direct the nozzle to spray towards the target area, and away from swimming pools, water bodies, eating and cooking areas, windows and doors. Direct the nozzle downwinds and treat when wind velocity does not exceed 10km per hour. Application in the evening and or early morning is recommended. You can choose to set the dispenser on 2 modes. REMOTE ONLY : activate the insecticide for 4 seconds by pressing the remote button. DUSK/DAWN + REMOTE : activate the insecticide for 4 seconds automatically at dusk and dawn, and by pressing the remote button. To avoid exposure to outdoor pets, use only in REMOTE ONLY mode if pets live outdoors. If the aerosol can refill unit came flatted with an actuator, remove and discard both the cap and actuator. After placing the aerosol container in the dispenser, do not remove and re use for handheld aerosol application. Use the dispenser only when listed pets are present. Always place the dispenser and the remote out of reach of children and pets. Do not allow adult, children or pets to enter until the vapors, mists and aerosol have dispersed. Apply mist directly on insects and their nests from approximately 45cm. Contacted insects will fly away from fog. Applications should be made in late evening when insects are at rest. Disperse into hiding and breeding places contacting as many insects as possible. Do not allow adults, children, or pets to enter the treated areas until sprays have dried. Do not apply directly to or near water, strom drains, or drainage ditches. Do not apply when windy. To prevent product run-off, do not over water the treated area(s) or apply prior to heavy rainfall. Do not apply when people, pets, or food are present. Use only with the supplied actuator. Do not spray on public, painted or vanished surfaces or directly into any electrical or electronic equipment such as breaker boxes or fuse boxes, air conditioning units, telephone or cable boxes, etc.